(Nanowerk News) It’s one thing for humans to lose track of time, but what happens when our clocks do? In an increasingly networked world, devices need to be more punctual than ever. To keep them running as we expect, they depend on an army of tiny, vibrating components. A finding from a team led by scientists at the Center for Nanoscale Materials (CNM), a U.S. Department of Energy (DOE) user facility at Argonne National Laboratory, could ultimately help improve such components in a range of electronics and even create devices that mimic biological processes. 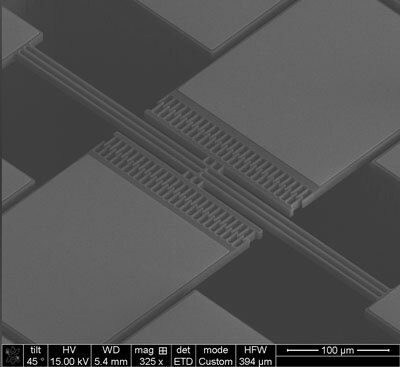 The researchers have pioneered a micromechanical device that responds to external signals in an entirely new way compared to conventional ones. Their work, conducted by a team spanning five institutions including Argonne, was recently published in the journal Physical Review Letters ("Bifurcation Generated Mechanical Frequency Comb"). A typical resonator in an electronic device responds to one signal with one corresponding frequency. In wristwatches, for example, a quartz resonator vibrates at a specific frequency when a certain voltage is applied, and that vibration marks the time. But a multitasking network of devices might require responses at more than one frequency, and that’s where things get tricky. While a common approach to this problem involves multiple resonators, multiple signals or both, the researchers created a single, microsize resonator that can generate multiple frequencies from one signal. This set of frequencies is called a frequency comb, so named for the way the frequencies appear evenly spaced, like teeth, when plotted on a graph. The research was conducted partly at the CNM, where researchers designed the resonator and used electrical characterization techniques to measure its responses. The silicon device, which is no bigger than a few grains of salt laid end to end, anchors three beams that move together in two vibrations: a side-to-side swaying motion and a twisting motion. The researchers used this duality to generate the frequency comb. “We use the interplay between those two vibrations to obtain this frequency response that ends up looking like a frequency comb,” Czaplewski said. Frequency combs are more commonly used in the field of optics, where they consist of laser light pulses and can be used to measure time accurately. In another application, this mechanical frequency comb, the researchers said, can be used to study a specific type of dynamic known as a SNIC bifurcation (saddle node on an invariant circle) in mechanical, optical and biological systems. In a biological setting, for example, understanding this behavior could aid in the design of micromechanical elements that emulate the way neurons respond to stimuli. The mathematics describing the vibrations in this resonator were carried out in collaboration with a team of experts in the field of nonlinear dynamics at multiple universities. The next step in the research, Lopez said, will be to reproduce the frequency comb phenomenon in higher-frequency resonators and extend the number of 'teeth' – or frequencies – that can be generated.